I Feel Free (live, 1972). I Feel Free (backing track, 1980). I Feel Free (Black Tie White Noise, 1993). Cream’s “I Feel Free,” a staple of the early Spiders From Mars shows, was both a crowd-pleaser (it was a hit song in a set mainly consisting of unreleased material) and a means to let Mick Ronson solo like a madman (“Width of a Circle” later filled this role). “I Feel Free” was a memory chain for Bowie, as his half-brother Terry had suffered an attack during a Cream concert in Bromley, as well as for Ronson, who had worshiped Cream as a teenager and who, in The Man Who Sold The World, had made a tribute album to them. Bowie made a habit of almost covering the song on record. “I Feel Free” nearly made the cut for Pin-Ups, while another attempt during the Scary Monsters sessions in 1980 survives in bootlegs as an instrumental track. In 1992, Bowie finally cut “I Feel Free” for Black Tie White Noise. By then it had become an elegy for Terry Burns, who had killed himself in 1985, and a tribute to Ronson, who was dying of cancer and whose guitar solo on the track was among his last-recorded performances. Ronson died at age 47, a few days after the record was released. The “I Feel Free” performance from Kingston Polytechnic on 6 May 1972 was later collected on RarestOneBowie, a semi-official bootleg released in the ’90s by Bowie’s estranged former management company. The Black Tie White Noise recording, an attempt at contemporary R&B as perpetuated by Nile Rodgers and with Bowie intoning the lyric in his lowest register, was cut ca. autumn 1992 and released in April 1993. The video features a 46-year-old Bowie at the height of his Dorian Gray period and a motley backing band that includes the Manhattan Transfer’s stunt doubles, an eyepatch-wearing man apparently hired to gyrate in place, and a Jimi Hendrix impersonator who mimes Ronson’s guitar solo. 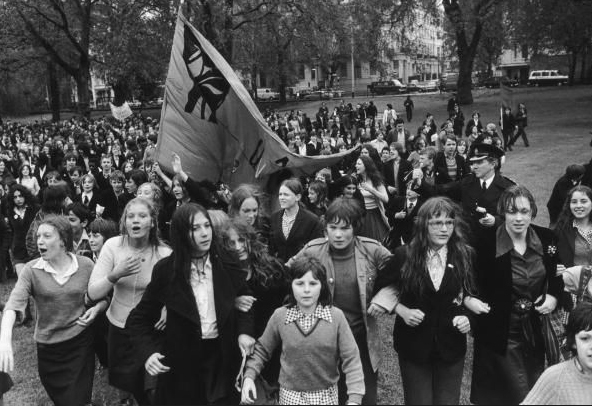 Top: March by the Schools’ Action Union and the National Union of School Students, Speaker’s Corner, Hyde Park, 17 May 1972. Around and Around (Chuck Berry, 1958). Around and Around (Rolling Stones, 1964). Round and Round (Bowie, studio, 1971). Round and Round (Bowie, live w/Jeff Beck, 1973). “Round and Round” (Bowie’s diminution of Chuck Berry’s “Around and Around”) nearly made Ziggy Stardust and nearly even titled the album. Sequenced to follow the annunciation of “Moonage Daydream,” the song was essentially footage of the Spiders in action. By the time Bowie returned to Trident Studios in early 1972 to finish the album, he’d worked up “Suffragette City.” As the latter sounded like Chuck Berry lost in a William Burroughs novel, it made an actual Berry cover redundant. Bowie stockpiled “Round and Round” for a future B-side. Born from a jam and likely to expire in one, “Around and Around” had come out of Berry hanging out before a concert with some “on-the-ball musicians…playing standard sweet songs to gut-bucket rock and boogie.” Issued as the B-side to “Johnny B. Goode” and included on the 1959 LP Chuck Berry Is On Top, “Around and Around” was in the repertoire of any half-competent British beat group. (In June 1964 the Rolling Stones, in an act of competitive worship, cut a version of it at Chess Studios in front of Berry himself.) It was audience bait: its stop-time verses tantalizing dancers, its chorus releasing them. Offering the sweet promise of a club that’s never heard of closing time (until the cops kick in the doors), “Around and Around” was Mod solidarity: there are no girls to impress, no boys making a scene. Where the Stones’ and the Animals’ covers had prominent piano, the Bowie/Spiders take hangs entirely on Ronson’s distorted Les Paul and Trevor Bolder’s bassline. Ken Scott recalled the track needing the fewest overdubs of any Ziggy Stardust-era cut. With little hope of matching Berry’s rhythms, the band set about clobbering the song, pushing up the tempo, knocking the guitar solo back until after the second verse, letting the track expire in a Ronson fusillade. It was the template for how Bowie and Ronson would record Pin Ups the following year. Recorded ca. 8-11 November 1971. Issued as the B-side to “Drive In Saturday” in April 1973, and also included on the Sound + Vision box set. It was the final song of the final “Ziggy Stardust” show at the Hammersmith on 3 July 1973, though it was cut from the subsequent concert film (allegedly at the orders of Jeff Beck). 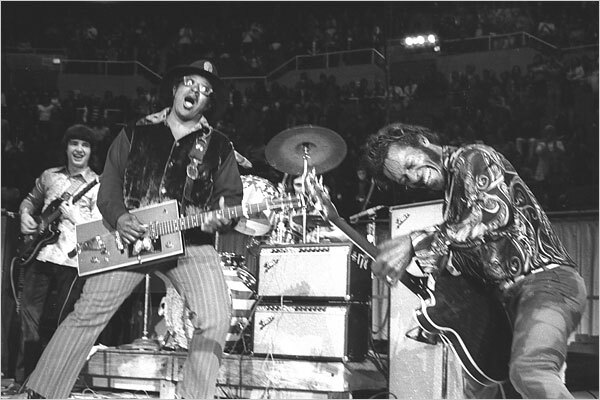 Top: Bo Diddley and Chuck Berry at Madison Square Garden, 6 May 1972. You have to start with the riff, right? Two bars long, it repeats four times in the intro, twice after the first chorus, three-and-a-half times at the end. It’s only five seconds in each duration but is perfect and complete: a slammed G chord, a fanfare, then the tough connective tissue leading to the next G chord. To make a riff like this, for guitarists, is like forging a passkey to Valhalla. (That said, the song’s demo reveals that Bowie’s responsible for most of it.) And the riff’s only one of Mick Ronson’s voices on “Ziggy Stardust.” There’s also the motif under “Spiders From Mars” or “the kids were just crass” in the verses, the tonal colors Ronson provides throughout the track, the vicious root chords in the chorus. But “Ziggy Stardust” wasn’t intended as a guitarist’s tribute. It has grandiosity bred into it—it’s a paradox epic (the song that births “Ziggy” also kills him off), a plastic ballad (the verses move from G to B minor and later E minor, transitions that Roger McGuinn, noting the same change in “She Loves You,” described as “folk music changes” pilfered by rock musicians), a eulogy for a phantom. Even by the meager standards of rock “concept” albums, The Rise and Fall Of Ziggy Stardust and the Spiders From Mars is a thin business. The collected songs are recycled Arnold Corns singles, random covers (Jacques Brel’s “Amsterdam” and Chuck Berry’s “Around and Around” almost made the final cut), and a few Hunky Dory leftovers. Even the last batch of tracks cut for the LP in early 1972 (“Rock & Roll Suicide,” “Suffragette City,” “Starman”) are only tenuously linked. Bowie’s unifying lyrical theme basically consists of using the word “star” in a few songs. Despite this nonsense,”Ziggy Stardust” himself is one of Bowie’s best conceits. Ziggy’s ancestry included Iggy Pop, the mad British rock & roller Vince Taylor, the American eccentric The Legendary Stardust Cowboy (and there’s probably a touch of Biff Rose in the mix too), and rock & roll casualties like Brian Jones, Jim Morrison and Jimi Hendrix. Bowie pulped them all together. Ziggy’s been described as a “cartoon” rock & roller but that’s not quite right: cartoons have weight and presence, holding fixed positions in your memory (think of the eternal Charlie Brown or Superman). Ziggy is fluid and unknowable, a pictograph whose meaning alters depending on who looks at it. His existence depends on his audience. 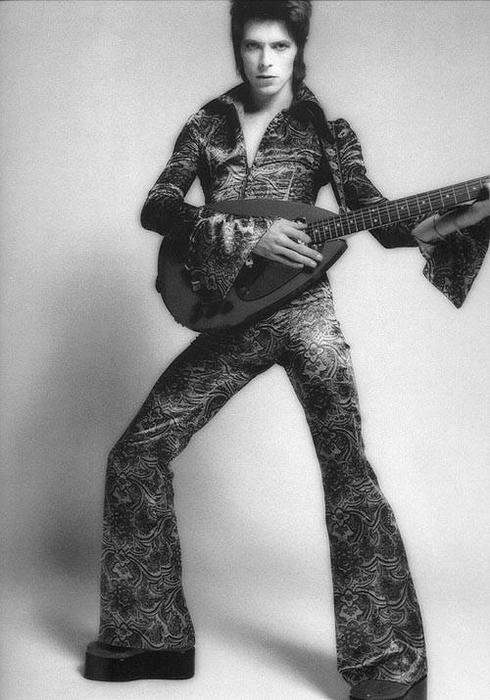 By 1972, with rock music falling into nostalgia and self-parody, Bowie was able to paint a rock & roll life in a few broad strokes, taking from listeners’ collective memories (e.g., “he played left hand” references Hendrix), with the track serving another of Bowie’s mime performances. Bowie filled the lyric with pseudo-American slang (“jiving us that we were voodoo”), built Ziggy’s image out of pieces (“like some cat from Japan,” “well hung and snow-white tan”). It’s unclear who’s narrating. It could be a kid in the audience, remembering Ziggy years later (like the Christian Bale character in Velvet Goldmine), it could be one of Ziggy’s bandmates, Weird or Gilly, or it may be the disassociated memories of Ziggy himself, a fractured perspective through which Ziggy sees (and kills?) himself on stage. It could be all of them, recounting a story that had ended and now needed to begin. If “Ziggy Stardust” was the score, Bowie’ s life over the next two years would be the performance. 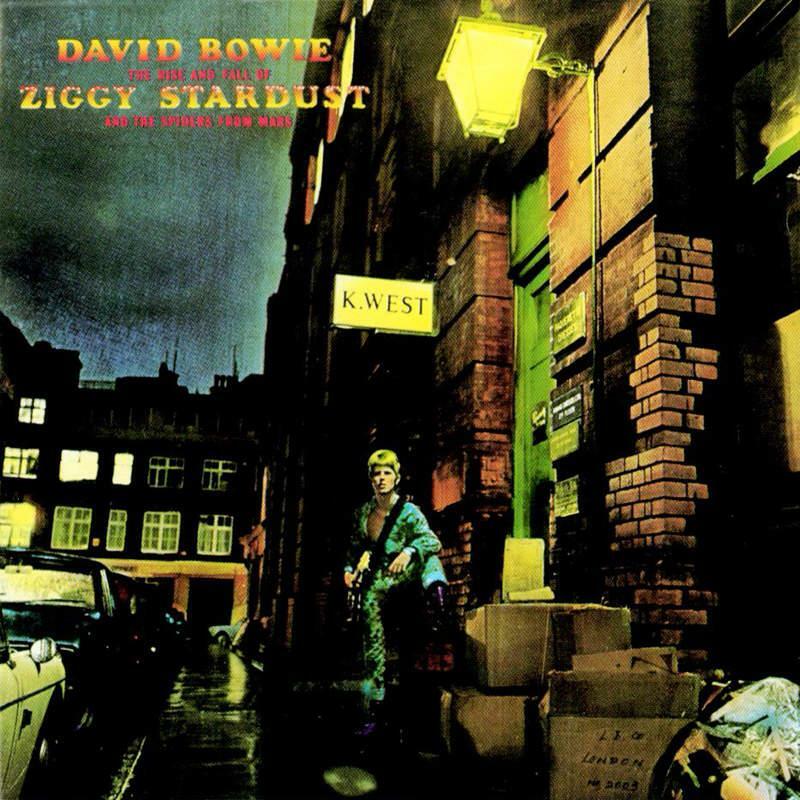 The “Ziggy Stardust” demo, recorded ca. summer-fall 1971, is on the Ryko 1990 CD of Ziggy Stardust. (Bowie didn’t give the demo to Ken Scott, his producer, or his band, instead just playing the song to them on guitar in the studio.) The LP cut was recorded 8-11 November 1971. Three versions of “Ziggy” were taped for the BBC during 1972, and it was central to the 1972 and 1973 tours (a version taped at Santa Monica, Calif., was released as a single in 1994). “Ziggy” returned in Bowie’s 1978 tour, with a recording from Philadelphia on Stage; the song also was a regular on the 1990 “Sound + Vision” tour, as well as many of Bowie’s shows in the past decade. Bauhaus’ remake hit #15 in the UK in 1982, and was later collected on David Bowie Songbook. Top: Ziggy in his youth, ca. March 1972.